One day in Naples: best treats! 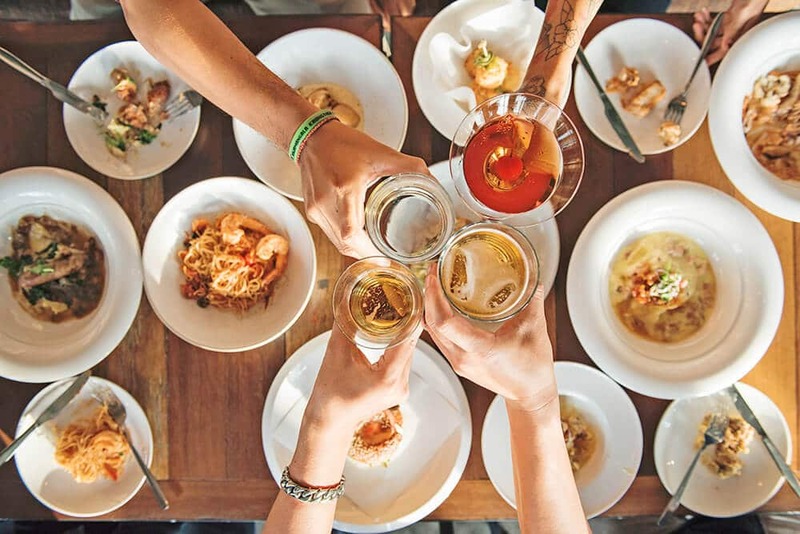 Naples is a very popular port for the best cruise ships, as well as one of the most loved stops for the cruisers interested in foodie tours to taste the traditional Neapolitan dishes. Many decide to pay for an expensive day tour: there’s no need to! Here’s a self-guided walking tour to spend one day in Naples, full of useful tips from a local! There are so many things to do in Naples, but I know just the way to plan a budget one day trip. Let’s see how! Many people hop on a ferry from the Amalfi Coast to Naples and go straight for a visit to Pompeii. Others disembark from a cruise ship and pay for expensive tours that only show them the outskirts of my city: visiting Naples in a day doesn’t mean that you only get to see one street! I am well aware that planning a three or four days trip would be the perfect way to visit Naples, but if you can’t do that, why don’t you try to make the most out of your day? One day in Naples means that you will have to skip the popular spots like via San Gregorio Armeno (also known as Christmas Alley), yet not many people know that from Molo Beverello (the main harbor) you can just walk to some of the top things to see in Naples! The Fontana del Tritone is the perfect spot for a yummy break! If you are visiting the Amalfi Coast and its beaches, getting to Naples is particularly easy. Either you get a bus to Sorrento and then a train to Napoli Centrale (the biggest train station in Naples), or you hop on a ferry. There are daily ferries (here we call them “metro del mare“, which means “sea subway” in English) from Amalfi, Positano and Sorrento to Naples. Prices and journey time depend on where you are staying on the Amalfi Coast. On average it should take you about 2 hours to get to Naples from Amalfi. If you are planning your trip to Italy in spring or summer, I suggest you use the ferry in stead than buses and trains. I’m not saying it to scare you away, because Naples is a safe city, but the Circumvesuviana trains can be quite confusing and buses tend not to show up sometimes due to the traffic jams on the Amalfi Coast. For a winter trip you might be forced to use the Circumvesuviana because ferries can be suspended due to the bad weather. In case you are staying in Naples already, use the Art Metro to visit the best of Naples in a day. Toledo is considered the most beautiful subway station in Europe and it’s located in the middle of my suggested itinerary. To get there use the subway: Line 2 is where most of the Art stations are located! Buy a ticket TIC Unico Campania. You will need to ask for a “biglietto giornaliero” (daily ticket) for Naples. It costs 4,50€ and you can obviously use it for the whole day. A daily ticket is the most cost-effective way to spend one day in Naples by public transport. Yet validating your ticket on every ride is still mandatory, even with this kind of ticket. Write down your name, date of birth and the date with a pen on the ticket in a clear, readable way. If you fail to do so, you might be fined! Are you on a cruise? There’s no need to buy a public transport ticket! 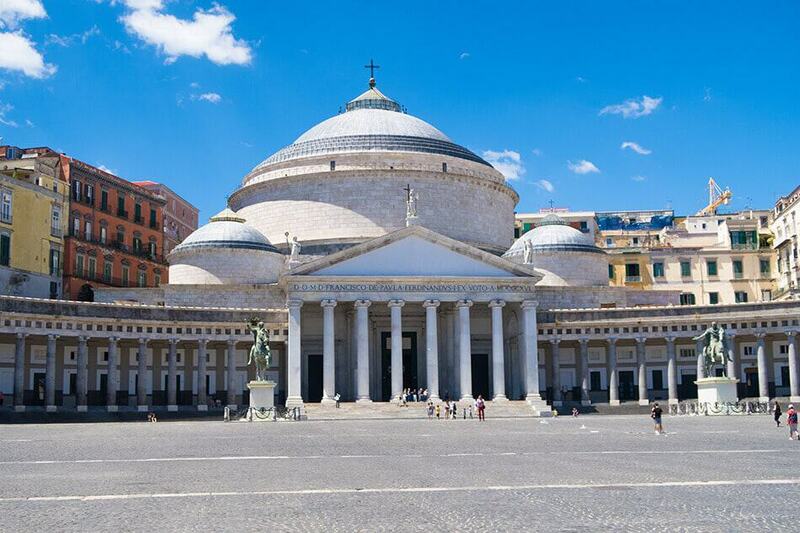 This is a self-guided walking tour to spend one day in Naples. You will disembark (as those who are getting to Naples from the Amalfi Coast) at Molo Beverello, which is the starting point for this itinerary. Useful info: Molo Beverello is also where you have to go for a day trip to Capri. Unfortunately on this occasion there is no time to visit this beautiful island! Please don’t rush your day trip to Naples: there’s no need to! You can and should explore at your own pace while eating delicious treats. I am sure you will fall in love with Naples so much that you’ll decide to get back for a longer trip! From the harbor you will immediately notice the unmistakable shape of the Maschio Angioino castle, also known as “Castel Nuovo“. It dominates the scenic Piazza Municipio. This mighty castle was built between 1279 and 1284 by Charles I of Anjou, and has welcomed important writers, poets and artists as Giotto, Petrarch and Boccaccio over the years. The Palatine Chapel, which is today the seat of the Civic Museum, is still intact. According to the legend, in the Castel Nuovo underground prisons there was a huge crocodile that fed on the prisoners who had earned a death sentence. There never was a crocodile in Naples, but everyone used to think so. The prisoners were terrified of being sentenced “to death” (by the crocodile)! 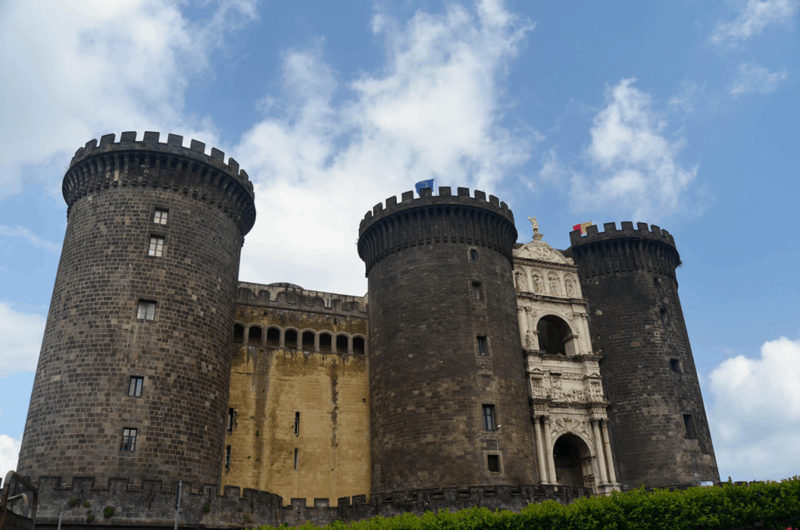 Want to know more of Naples Castles? Find out in my article for Helene in Between! The Town Hall in Naples is located inside an historical building, Palazzo San Giacomo, at Piazza Municipio. This is one of the largest squares in Europe! The area was recently restored and it’s magnificent. Via Medina is a large street where there are lovely Christmas decorations that you’ll see if you’re planning to visit Italy in winter. Cross it carefully and walk towards one of my favorite fountains in Naples. Fontana del Nettuno (Fountain of Neptune) has been brought back to life in 2018. With Palazzo San Giacomo at its back, Castel Nuovo on the front, the historical Grand Hotel de Londres on the side and some amazing historical buildings all around, it’s one of the most instagrammable spots in Naples. There are some lovely marble benches near the fountain and a café near by. 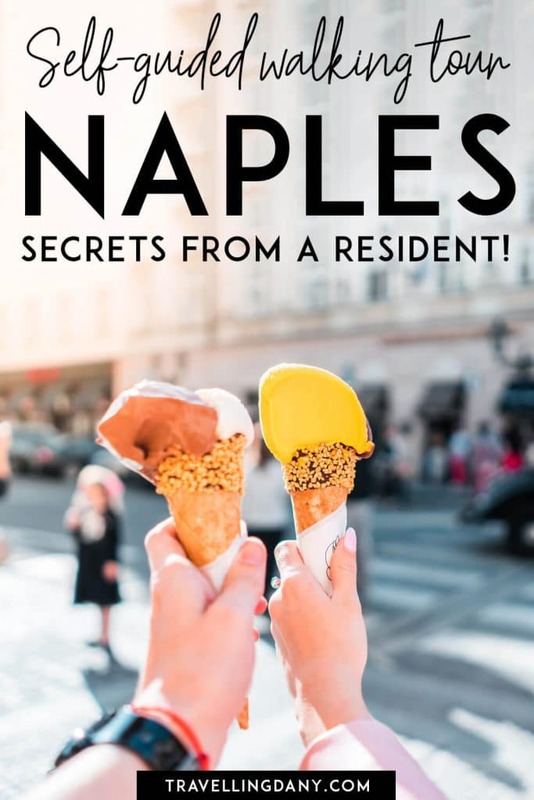 Stop here to eat some Italian gelato or to drink a cup of Neapolitan coffee: there’s some shade, which is perfect if you’re going to visit Naples in summer! 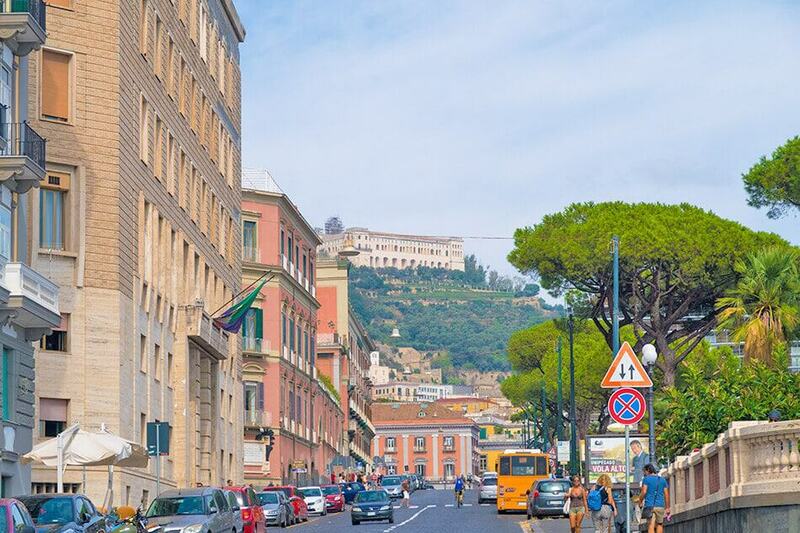 When you’re ready to go, walk the promenade next to the Maschio Angioino to the Royal Palace of Naples. This palace and museum is usually featured among the top places to visit in Naples. It was one of the four residences used by the Bourbon Kings during their rule of the “Regno delle due Sicilie” (Kingdom of the Two Sicilies). The others were the Royal Palaces of Caserta, Capodimonte (overlooking Naples) and Portici, on the slopes of Mount Vesuvius. If it’s still early in the morning, you can visit the Royal Palace: I love the marble staircase at the entrance! In case you’re a movie nerd like me, you’ll like to know that this staircase looks a bit like the Grand Staircase of Honour at Caserta, featured in movies like Angels and Demons, Mission Impossible III and Star Wars Episode II: Attack of the clones (did I mention I’m a nerd?). The visit should take at least one full hour, but if you like history and art, you might stay for a couple of hours (worth the time, in my opinion). You’ll see the Royal Apartments, the roof gardens, the Throne room and the National Library. Tickets cost 6€, but if you are living in the EU and are between 18 and 25 years old, you’ll only pay 2€! Visitors under 18 years old who live in the European Union can visit the Royal Palace of Naples for free. If you don’t have enough time or don’t want to pay for a ticket, you can visit part of the gardens for free (not the roof gardens). And you’ll enjoy some amazing statues that are very famous in Naples. Keep reading for more info! I promised one day in Naples without breaking the bank, didn’t I? 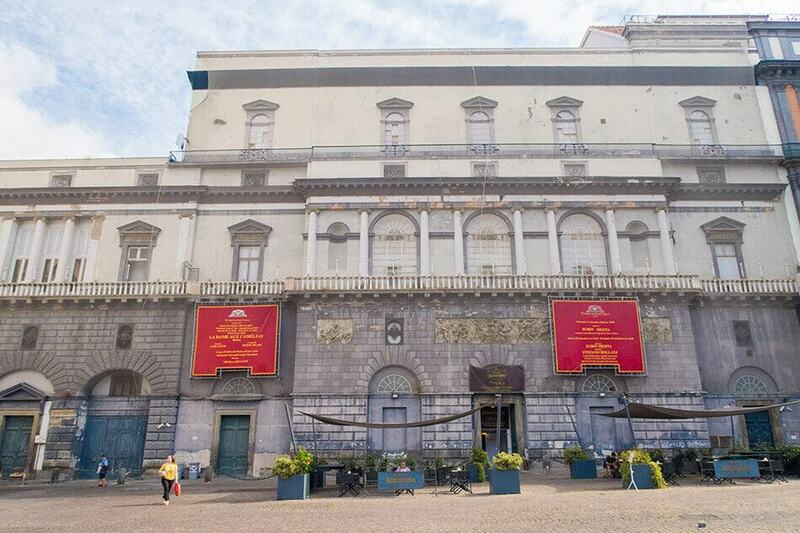 Unfortunately you won’t see the magnificence of our most amazing theatre in Naples from the outside. The San Carlo Opera house is connected to the Royal Palace and while the building has been only recently restored, as you’re strolling through the busy streets of Naples you might not even realize what lies inside. While many people who have visited Milan believe that the Teatro alla Scala is the oldest one in Italy, they are wrong! 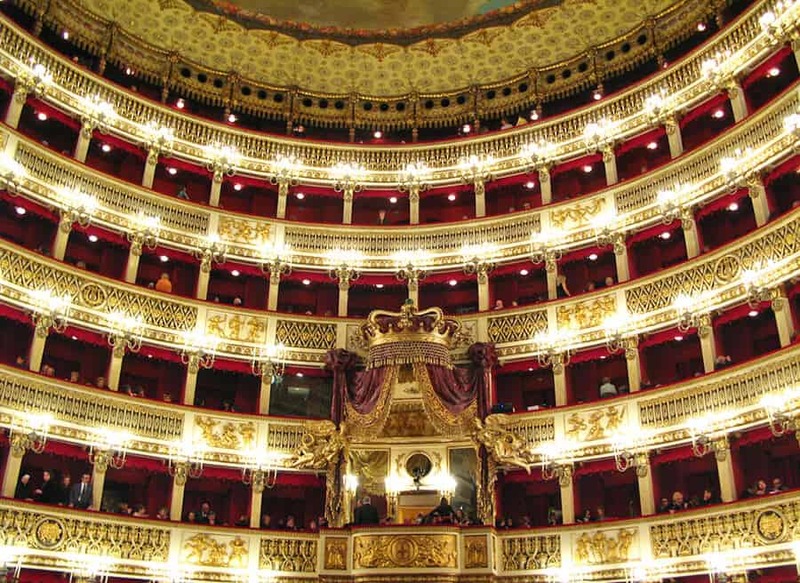 Teatro di San Carlo is the oldest active venue for public opera in the world: it was opened in 1737! Since you’re only staying in Naples for a day, you might not have time to visit this iconic Opera House. A visit lasts 40 minutes but it has to be booked in advance and might be cancelled without notice. There are still so many things to see in Naples that I suggest you to save the San Carlo for your next visit, when you’ll have more time! 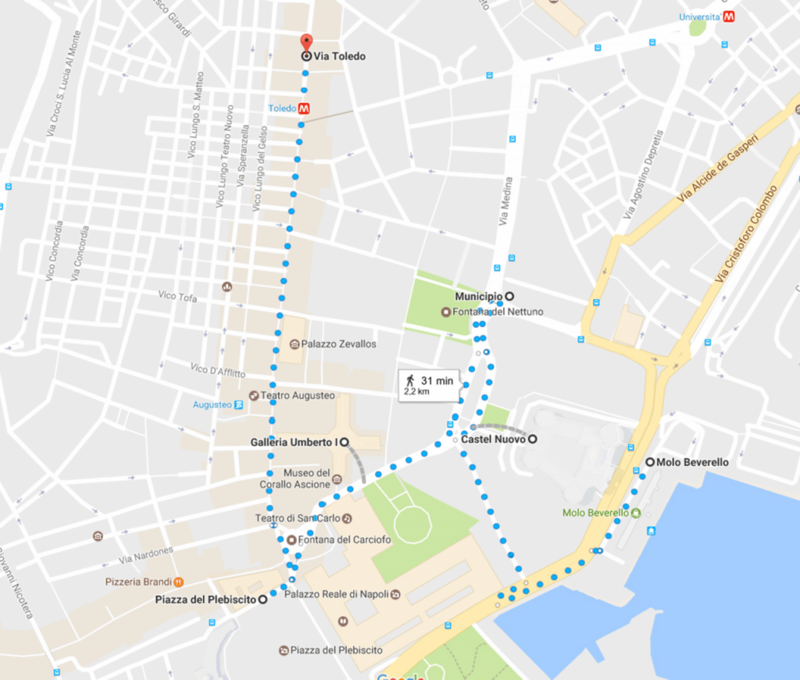 While my itinerary for one day in Naples suggests you keep walking in front of you to make one nice loop that will get you back to the Molo Beverello, you have the option to stop again at this point. Across the street from the entrance to the San Carlo Opera House there’s the Galleria Umberto I (which, again, looks a lot like the Galleria Vittorio Emanuele II in Milan). Under the glass dome there are many shops and cafes. 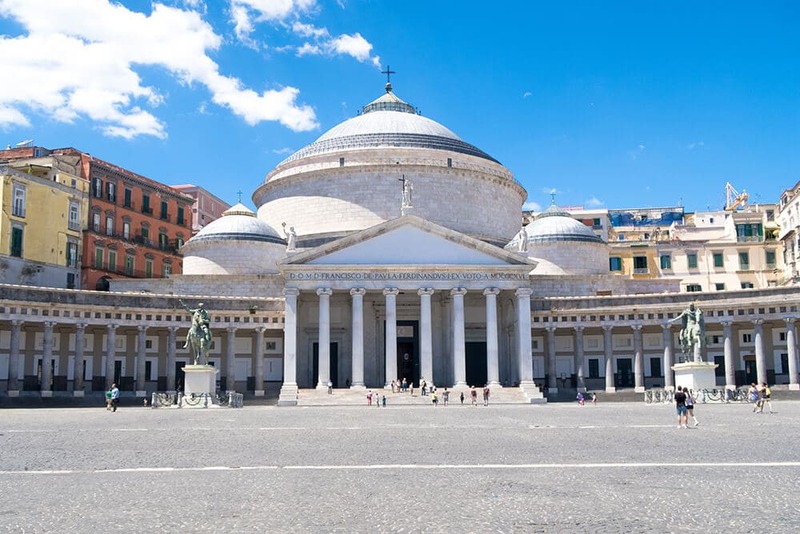 If you follow my itinerary there’s a good chance you’ll get to take amazing pictures of Piazza del Plebiscito without the usual crowd of tourists, so keep walking towards Piazza Trieste e Trento: I promise you’ll have time to stop at the Galleria later! Piazza Trieste e Trento is located in the city centre and can be recognized by the Fontana del Carciofo (Artichoke Fountain: I swear that’s the English translation!). Once you get there, I dare you not to stay there with your mouth open for a few moments. I am Italian, Naples is my hometown, and still I am in awe whenever I come here. 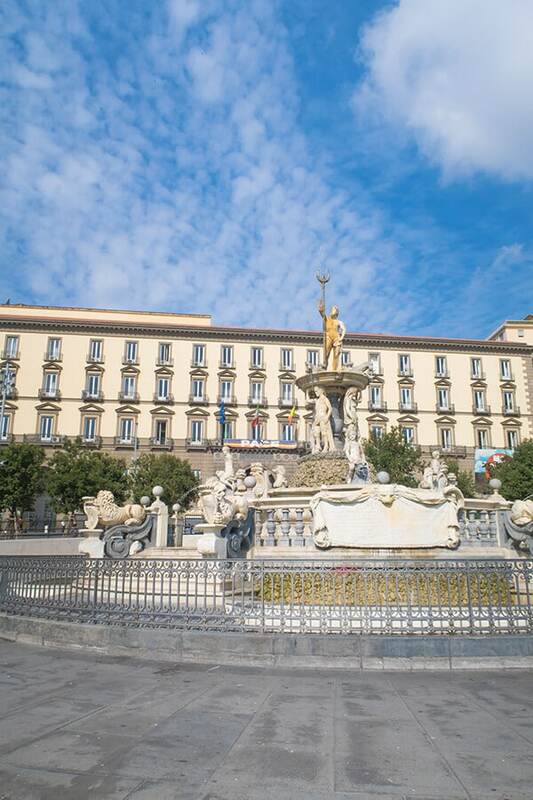 From this fountain you will see Via Toledo and Via Chiaia, the two shopping streets in Naples where you can buy awesome souvenirs from Italy, the San Carlo Opera House, the Royal Palace of Naples, the historical Grand Cafe Gambrinus and Piazza del Plebiscito. 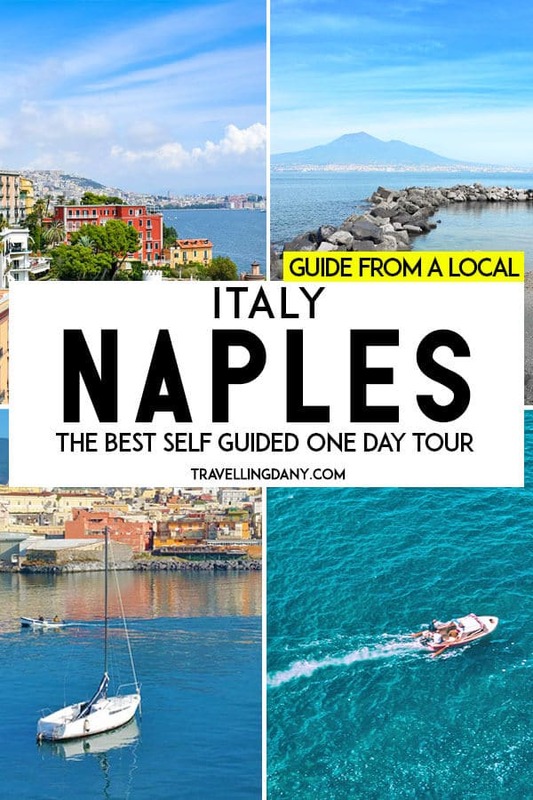 And that’s why I told you that this is the best itinerary out there if you only have one day in Naples! You’ll get to see the most amazing spots in my city in just a few hours. 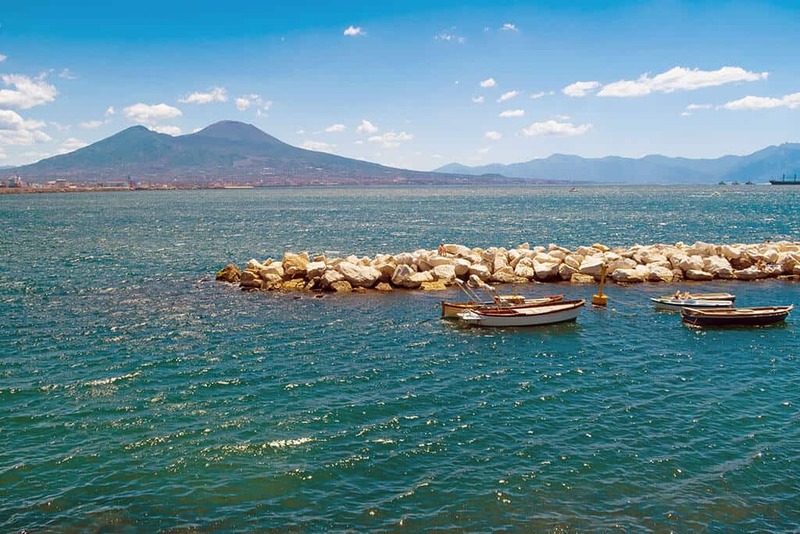 It is the area that will make you fall in love with Naples, if you haven’t already! Piazza del Plebiscito is easily another one of my favorite spots in Naples. This huge square is close-by to a lot of awesome attractions. If you haven’t seen the inside of the Royal Palace of Naples, know that on a side of Piazza del Plebiscito you will get to see the statues of the eight Kings of Naples for free. As you might have guessed already, Neapolitans are quite creative with their legends. When the statues of our Kings were built, in 1888, people immediately created a funny story about them. As you walk from Piazza del Plebiscito towards the Gulf of Naples, look at the statues. Please, have a look at the statues and imagine them talking among each other! They look as if they are actually having this conversation, it is pretty realistic, albeit it reflects the way of the “scugnizzi“, the Neapolitan kids usually playing soccer in Piazza del Plebiscito and having fun. What can I say… Napoli, I love you! 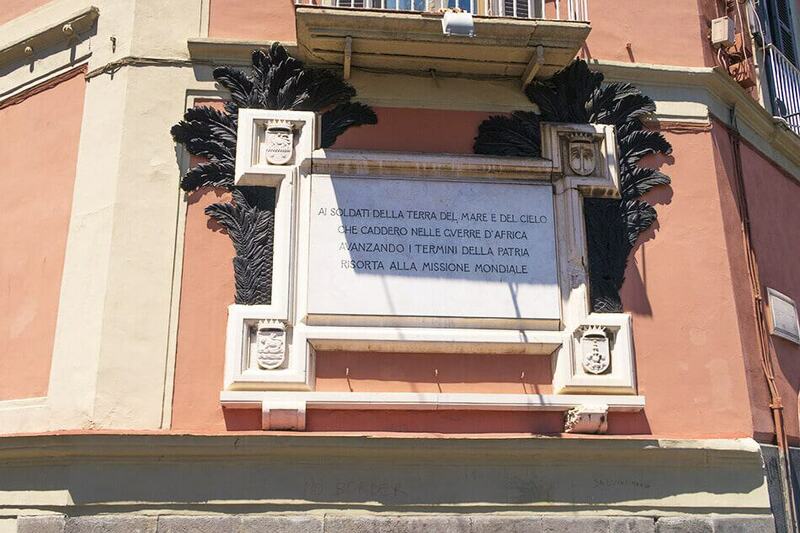 There are many “hidden” monuments in Naples! Piazza del Plebiscito is the place where in May 2013 Bruce Springsteen and the E-Street band gave one of the most amazing concerts of their carreer. I was there and upon seeing the Boss tearing up a little while telling us “It’s beautiful to be home“, made me feel so proud of my city. Because the acoustic in this square is absolutely amazing, it’s occasionally opened for concerts, like the free one we have every New Year’s Eve. The half-moon church you see on one side is the Church of San Francesco di Paola with its beautiful colonnade, extending on both sides as if to hug Piazza del Plebiscito. If you cross diagonally the whole square, you’ll get to Borgo Santa Lucia and the Grandi Alberghi, one of the most expensive lodging areas in Naples, and for a good reason. Stop here to take awesome pictures of the Gulf of Naples: you will see Castel dell’Ovo (Egg Castle) in the distance! 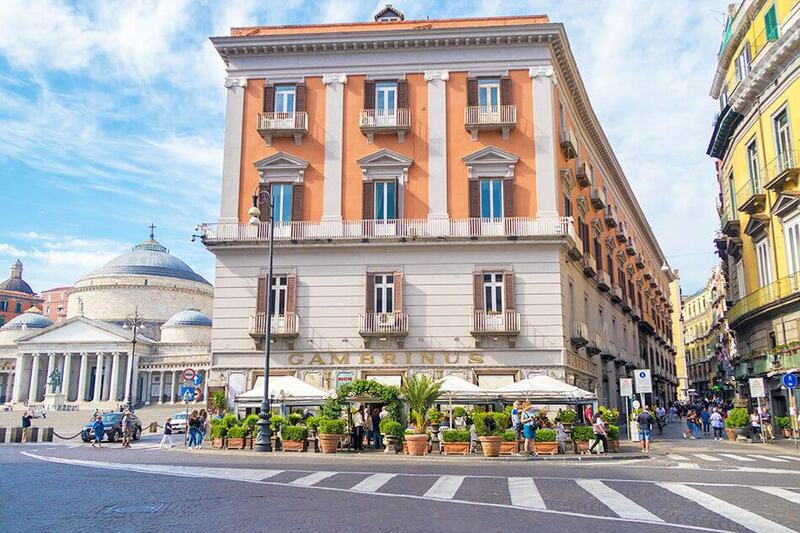 As you return towards the Fontana del Carciofo, you will find two of the nicest cafes in Naples. One is Grand Cafe Gambrinus, which opened in 1860 and is like a museum inside. Another, a few steps away, is the tiny Bar del Professore, which is the local alternative to Starbucks. You’ll get to try espresso with white chocolate, hazelnuts cream, pistachio and more! Where you want to stop depends from you: Grand Cafe Gambrinus is pretty elegant and can be expensive, but here you might see politicians, movie stars or singers. Bar del Professore is tiny and less expensive (more easygoing), so you won’t really be able to sit down. Note: don’t eat anything! We’re almost at my favorite foodie spots in Naples! Via Toledo isn’t only the most famous shopping street in Naples. It’s also the place where you will find some of the oldest shops (you can order handmade leather gloves here), awesome Christmas decorations, and the entrance to the Toledo Art Station, considered the most beautiful in Europe by The Daily Telegraph and the CNN. While you stroll down this popular street, you have two options for a sweet break. Well, to be honest, two of my favorite shops ever, even if there are many more places where you can buy yummy treats along via Toledo! The first one is Pintauro, an historical little pastry shop on Via Toledo that you wouldn’t notice… except for the fact that it spreads such a sweet scent on the street! They make sfogliatelle, babà and struffoli (sometimes on a stick, like the dango we ate in Japan!). Another one is just a few steps away, at the entrance of Galleria Umberto I. Sfogliatella Mary has always been my favorite in Naples. When I was a university student I made sure to walk by this tiny pastry shop every day to eat a fresh-from-the-oven sfogliatella frolla. 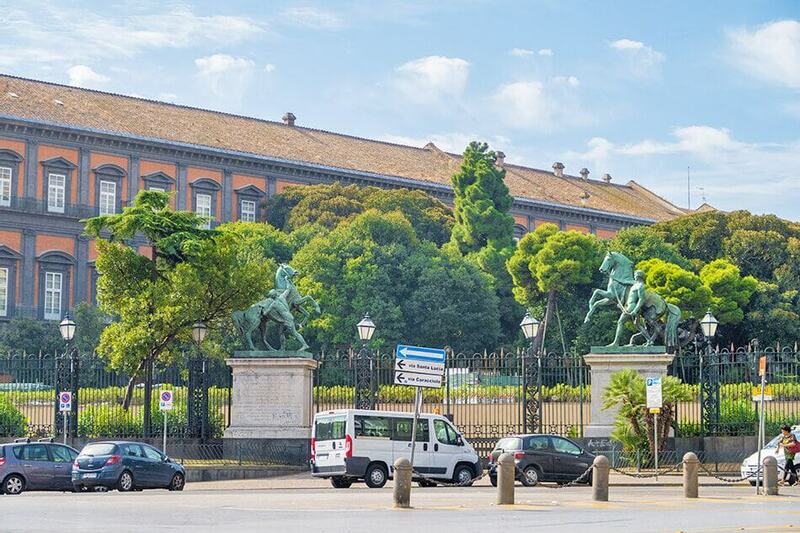 You can visit part of the gardens at the Royal Palace of Naples for free! Both these shops don’t have tables so you will have to eat your sfogliatella while walking. If you ask them, they will prepare your sfogliatella to go, so you can bring it back on the cruise ship or wherever you want. Be aware of the fact that a fresh sfogliatella frolla can last even two days, but sfogliatella riccia won’t be as crunchy and delicious if you eat it the following day! 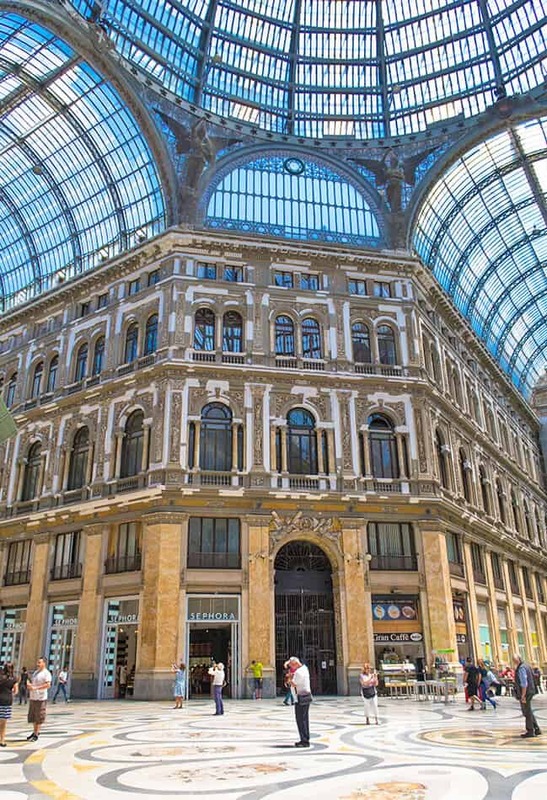 I prefer Sfogliatella Mary also because there are many cafes inside the Galleria Umberto I. I like to sit down for an espresso, or I just walk around doing some window shopping: there are many designer shops, just like in Milan! As I already mentioned several times, tipping in Italy is not expected, not even when you buy a delicious sfogliatella (a bit of a “shut up and take my money“)! Have a look at my tipping guidelines for Italy to make sure you won’t come across as rude! 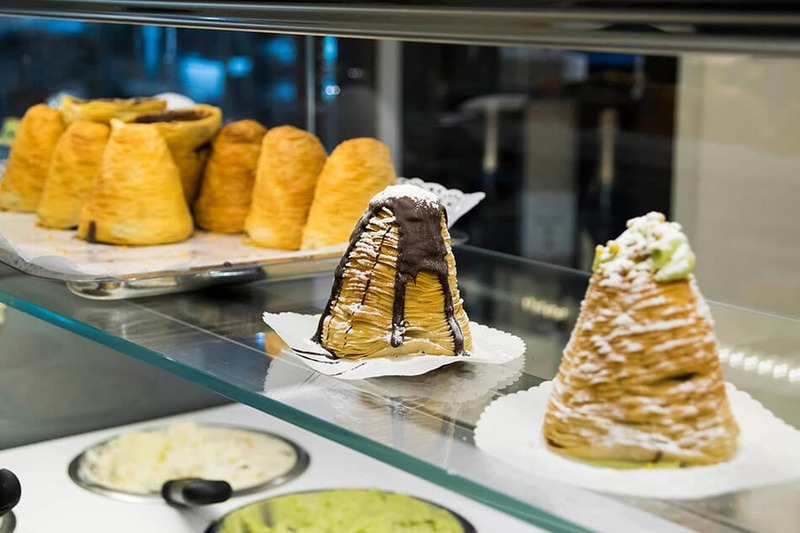 Even if you have only one day in Naples you should stop for a few treats along the way! Since you’re visiting Naples, which is one of the Italian cities where food is everywhere (yes, I’m totally biased), you should absolutely make a few foodie stops for treats along the way. One of my friends has been telling me that “Naples smells like delicious food everywhere you go” and that is true! Dolcezze Siciliane sells delicious pastries from Sicily at Molo Beverello! La Passione di Sofi on Via Toledo sells “cuoppo” which is a cone of paper filled with deep fried goods! Gay Odin on Via Toledo produces hand made chocolate treats since 1800: they also sell tiny Mount Vesuvius that they sell as souvenirs! La Sfogliatella Mary sells sfogliatelle (obviously), tiny caprese cakes, babà (also with whipped cream and fresh fruit) and more! I was so excited with your article on Naples. I have been there twice on tour and only get to spend the afternoon. In June we went to Gambrinus Cafe and a little shopping on (I think) Via Toledo. We are going back late September 2019 on our own and am thrilled to spend a few days in Naples. It reminds me so much of my neighborhood where I grew up. Thank you so much for your information! Ciao Diane! I’m SO glad you liked your trips to Naples! If you’ve been to Gambrinus Cafe and then walked around (I talked about Gambrinus recently in my article on Neapolitan coffee) then it’s definitely Via Toledo. It’s the oldest shopping street in Napoli, with all the fancy shops and the very old ones! I’m also happy to know you’re coming back, yay! Many people don’t realize how many things Naples can offer so they never tend to stay for a few days… and end up regretting it! Do you already have plans for your September 2019 trip? Great – really helpful – Thankyou! This is my second post on your blog and loving it. 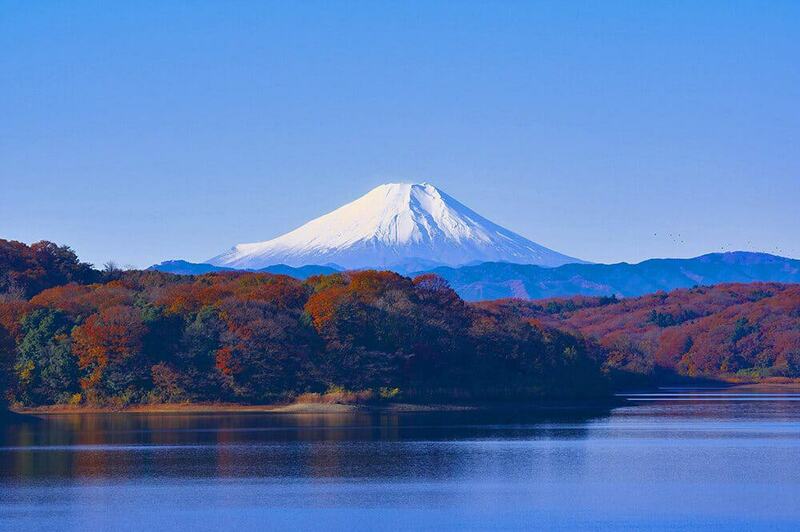 You have fully developed the art of preparing itinerary. I am more into history and heritage and Naples seems a perfect destination for me. I would love to explore royal palace some day. Naples looks like an open art gallery. Have bookmarked your blog for future ref. I fell upon your guide as I was looking for information about a Naples port day while I will be ther by cruise in a few months. It was a very interesting read. I am torn… we would love to visit Sorrento but I would also love to take a couple of hours and roam the streets of Naples. I feel like both can`t be done (on a cruise day). Am I wrong? If you ask for my opinion I’d say visit a bit of Naples on your port day and then plan a different trip, on another occasion, to see Sorrento, the Amalfi Coast and maybe also Capri. All of those are closer together so you can do them all in less than a week! I have only been to Naples once and it was long before I refined my research and pre-trip planning so we didn’t see a lot of the sights in your local’s guide. Now I need to go back, especially for Piazza del Plebiscito, which we somehow missed, though at least we did see the Castel! Not sure I got this, you were glad to have been in Naples just for one day so you could spend more on the Amalfi Coast? I’ve heard alot of good things about Naples. Especially the pizza! Would you recommend including Naples for first time visitors in Italy with only 2 weeks? Good to know Naples beyond its famous Pizza. I may have been one of those who chooses Pompeii over Naples but your post makes me think twice. Lovely images from the city. You mean that you stayed in Pompeii and not in Naples or that you spent the day at the Pompeii archaeological site? Because in this case it was still well spent! I love how you describe the art of espresso in Naples – it sounds so lovely and it’s great that dark chocolate is a big part of it! Haha we’re Neapolitan, espresso is a ritual here, we can’t live without it! The San Carlo Theatre looks like it’s straight out of a movie! I’d love to see a performance there and imagine how life was back in the 1700s. Having espresso outside on the patio while people watching also sounds like a great way to spend an afternoon in Naples. It’s in my opinion one of the gems in Naples that most tourists miss when they visit my city! And this area is so full of things to do and see that you can get the best of Naples also if you only have one day! I legit want to go to Naples just for the pizza, lol! I love the sound of that cafe- I had no idea there was such a thing as pistachio or hazelnut espresso- yum! If Naples is this spectacular, I’m afraid one day wouldn’t be enough. Excellent photos by the way! Absolutely nope, I always suggest at least 3-4 days in the city! Yet some people are cruising here and 1 day is the only thing they get. Thank you very much Rye! Gambrinus seems like a great place to have a coffee! I don’t mind paying a bit extra if the atmosphere is unique. Then you’d be surprised at Gambrinus, it indeed looks like a museum inside and it’s also very classy! I really enjoyed reading about Naples! When visiting other Italian cities, I particularly enjoyed the Italian piazzas. This will have to be on my next trip to Italy, and I definitely won’t pass up the opportunity to poke around that shopping district. Espresso in Italy! How amazing. The Italians in Toronto refer to it as “Espress!” “Can I get you some espress?” Haha! I sadly missed out on Naples when I was in Italy, but this guide is fantastic for those who are short on time in the area. I would love to return and travel here! That’s awesome, I had no idea! Are the Italians in Toronto from the South? There was a huge number of people who left Italy to move to the US or Canada, most of them from the South. I even happened to met a man in Idaho Falls who had been living next door to my grandma until he was 11 so when I met him in the middle of nowhere I was like… what? Meeting someone from your own little city on the other side of the globe is always awesome! We’ve been to Italy but haven’t made it to Naples yet. We really need to get there sometime for sure! Really looks like a great city. Castel Nuovo is really pretty and the San Carlo Theatre is gorgeous—I love how grand it looks! And can’t resist the espresso in Italy either—so many great suggestions! If you can’t resist espresso then you absolutely have to visit Naples! Here it’s a ritual, we can’t live without it and it’s also pretty strong and scented: a must try! A great guide to 24 hours – we spent 5 days, and used Naples as a base for day trips into the surrounds, but I think we could have definitely fit in our exploration of the city itself into a day. As you’ve said though, more is probably required if you want to check out the non touristy parts of the city. I think I spent the majority of my time jumping between resturants because the food was so good lol as opposed to seeing the actual city. Would love to head back and visit the Royal Palace and San Carlo Theatre – that theatre is stunning! San Carlo is VERY beautiful, although I’m not always lucky to find tickets to the shows I want to see, I’ve been there a few times and it takes your breath away! Naples is a place that seems to retain its old world charm. We would love to visit Naples next time we are in those parts. Till now our Italian adventures have been restricted to Venice, Florence, and Rome. I love the look of the Galleria Umberto. So fascinating to know that the Lumiere Brothers movie was screened here. What a great guide. My husband and I are thinking of visiting Ischia, so Naples will be on our list. I love Giotto, so anything in his footsteps like the Castel Nuovo would be great to see. That’s so weird about the crocodile! Hmm seems like most people only visit Naples for a day eh. I used to think there’d be so much to do that one day isn’t enough but looking at your itinerary, it seems perfect! And you’d think tickets at such a fancy theater would be expensive but no. Will definitely be adding night out at a historical theater to my list of things to do! Castles and stunning theaters and FOOD – say no more, I’m there. Serious travel inspo here!! Now I’m also thinking about how good that espresso must be… oh boy. Awesome writeup! Naples is famous in Italy for espresso and pizza so you wouldn’t be disappointed! I never feel like I have enough time in a particular place, so thanks for giving me the “here’s-what-to-do-when-short-on-time.” Good way to make sure I hit all the highlights. The Castel dell’Ovo would be a must for me. Castel dell’Ovo is one of my favorite too! Wow, nothing beats tips from a local. Packed itinerary but shows how much of Naples can be seen in 24 hours! I was in Naples many years ago, mainly as a gateway to the surrounding area I’m afraid, but your photos bring back memories of walking the streets, especially Galleria Umberto and Piazza del Plebiscito (I had forgotten that I was there!). Did you enjoy Naples, Damien? I love getting advice from locals and you make me wish that Naples was in my travel plans. Love the theater, plazas and dark chocolate with espresso. How awesome that you’ve been here already! I’m glad you had a nice experience here! Your cruise friends were sooo fortunate to have you on their trip and for you to be their personal guide to the best of Naples within a short time! I’m saving for when I next visit! Actually because I love so much my city I had so much fun in showing it to them! Have you already been to Naples? Could it get any better? Imagine being able to have you as a personal guide whilst being part of a cruise! They would have thought they’d found a pot of gold! I’m so sorry we skipped by Naples when we were last down that way. There was (of all things) a garbage truck strike going on and it was causing issues in the city and it was gridlocked and we simply couldn’t get off the motorway. We ended up going to Sicily instead. I’d be right at home in the Piazza probably drinking prosecco :0 or eating sfogliatella which I just love. are just superb! We have spent time in northern Italy, particularly Lago di Como but we need to come to Naples! Ciao Jenny and Bob!!! Thank you so much for writing! I’m glad you liked my article: I’m in love with my region and I’m always trying to lure peoplehere! 🙂 I’m sure you’d have fun in the Naples area! Do let me know if you decide to plan a trip here! Grazie! Haha you wouldn’t be disappointed! Castel Nuovo sounds amazing as does the rest of Naples actually. Having spent an enormous amount of time in Italy, it's probably time I stopped avoiding Naples. Have driven past it, enroute to Sicily but never stopped in. Thanks for sharing some of the highlights of your home town! I also visited Naples with a cruise, we even managed to squeeze Pompei in the day tour! I'm a big fan of castles so I'd love visit Castel Nuovo! Naples is high on my list to visit; it looks like there's so much to do there!